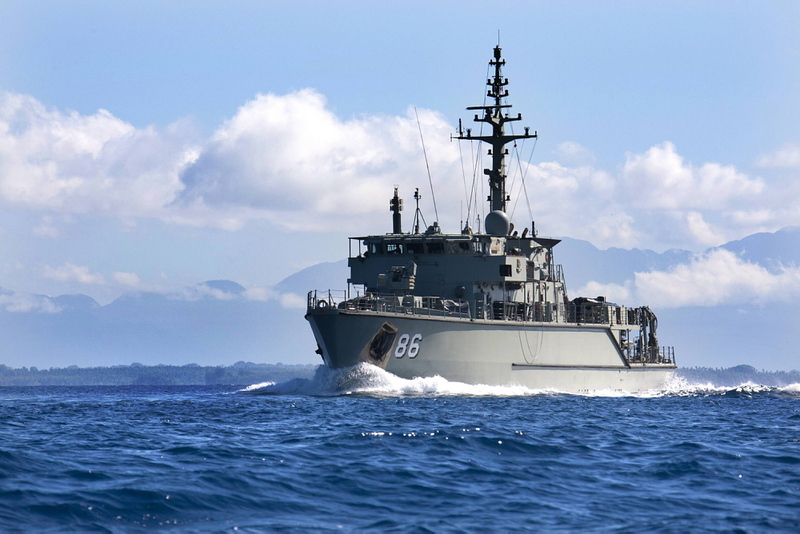 HMAS Diamantina is the fifth of six Huon Class Minehunter Coastal vessels being delivered to the RAN between 1998 and 2002, and represents the latest in Mine Countermeasures (MCM) technology. Diamantina is able to undertake extended MCM operations in widely dispersed and environmentally diverse threat areas within Australia and regional waters. The ship is the most advanced of its type in the world. Like her sister ships, Diamantina is made of fibre reinforced plastic and has a unique single skin solid hull that has no ribs or frames and provides high underwater shock resistance and very low magnetic and noise levels. This hull is designed to flex inwards if an undersea explosion occurs nearby. All machinery/equipment is mounted on cradles or suspended from bulkheads to further enhance resistance to shock damage and protect ship systems. The minehunter's principal task is to keep Australia 's maritime focal points for trade free from the threat of mines. The ship uses high frequency sonar to search for, detect and then classify mine-like objects. Once detected, the ship deploys a remote controlled mine disposal vehicle or clearance divers to identify and, if necessary, neutralise the mine. The Huon class minehunters are all named after Australian rivers. Diamantina is the second RAN ship to carry the name. Diamantina (I) was a River Class frigate that was in service from 1945-1980. She saw action during WW11, and from 1959 to decommissioning was employed as an oceanographic survey vessel.